AVALON — One of Catalina Island’s most popular summer traditions brings dancing in the streets back to Avalon. 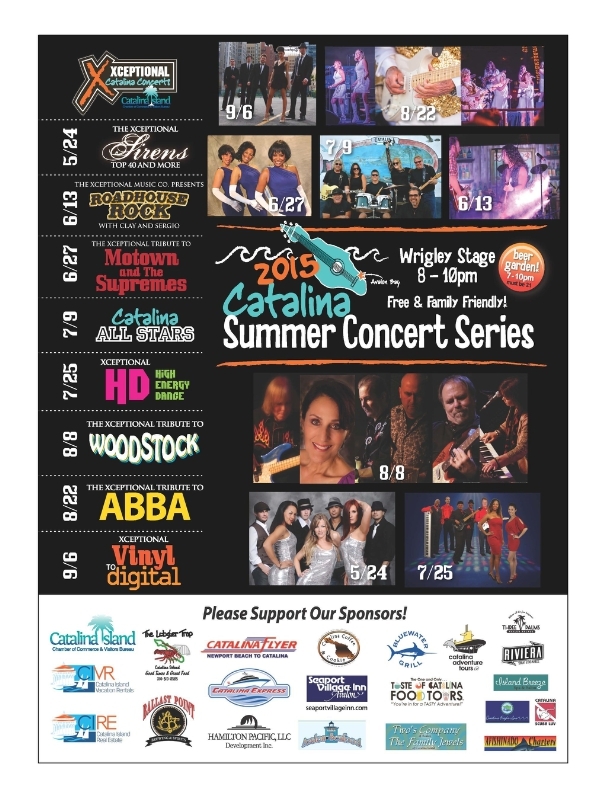 Presented by the Catalina Chamber of Commerce and Visitors Bureau, Catalina Island Vacation Rentals, Catalina Island Real Estate and Hamilton Pacific, LLC, the Xceptional Summer Music Concert Series brings together locals and visitors for some of the greatest dance-along, sing-along and family-fun music in Southern California. The concert series takes place on Wrigley Stage. Scheduled concerts include tributes to Motown, Abba and Woodstock as well as roadhouse rock and high-energy dance music. Some of Catalina Island’s top musicians will take the stage at the Catalina All-Stars concert and the series concludes in early September with a concert that showcases the greatest music from vinyl to digital. All of the Summer Concert Series performances are presented free of charge and are appropriate for all ages. A beer garden for those over 21 will be available from 7-10 p.m. The concerts begin at 8 p.m.
A complete schedule of events is available at rockcatalina.com.